Shirotae, also known as the Mount Fuji cherry, is one of the most beautiful of the white-flowered Japanes cherries. The pure whiteness of the mass of blossom contrasts nicely with the unusually dark bark. The Japanese word "shirotae" describes the dazzling whiteness of snow, and the blossom of Shirotae does indeed have the same intense whiteness. The flowers on mature trees are generally semi-double (having 10-20 petals), quite large, and often have a scent of almonds. The green leaves turn golden in the autumn. Shirotae grows with a wide spreading habit, and the top of the tree is often flat. It looks particularly attractive when planted as a specimen tree, set apart from other trees, or against a backdrop of taller trees. 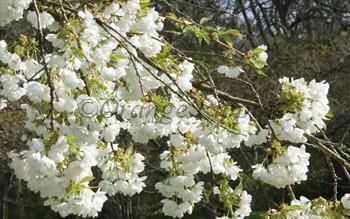 Please fill in the details below and we will let you know when Shirotae flowering cherry trees are back in stock. Shirotae is a form of Prunus serrulata, and arose in Japan in the early nineteenth century.